Democracy In Practice, a small non-profit organization dedicated to democratic innovation, experimentation, and capacity building, recently presented their ‘Student-Powered Democratic Experimentation’ initiative at the World Forum for Democracy in Lab 1: Reinventing school governance. 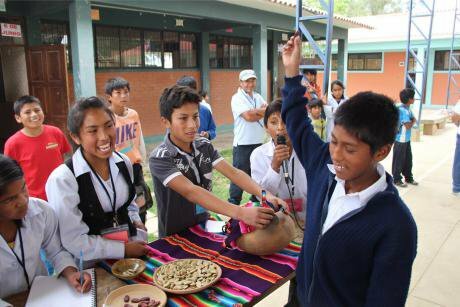 Their initiative, which was selected as a finalist for the 2016 Democracy Innovation Award, has taken place in public schools in Bolivia and experiments with creative ways of reinventing student government. 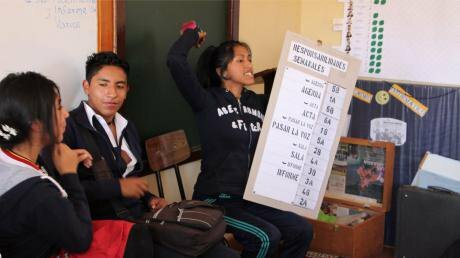 Instead of holding elections – which heavily advantage the most popular, outgoing, or ambitious students – these schools conduct lotteries to randomly select their student representatives. Used to form Citizens Juries and Citizens’ Assemblies around the world, random selection gives an equal chance to every student who wants to enter student government and develop civic skills – regardless of their level of popularity or charisma. In addition, terms of office have been shortened to allow students to rotate in and out of the student government, thereby increasing participation and the generation of new ideas. Traditional hierarchical roles, such as president and vice president, have also been replaced with more horizontal ways that students can work together as a team of equals. The shift from elections, full-year terms, and hierarchy to lotteries, rotation, and horizontal teamwork has made these student governments more inclusive, participative, and representative. Students conducting a lottery to select their representatives. Democracy in Practise. All rights reserved.Along with facilitating these structural changes, Democracy In Practice provides tools, processes, and capacity building to help the students operate effectively and democratically on issues they deem important. Past student governments have, for example, created libraries, issued student ID cards needed for public transit, met with their city’s mayor, and organized educational field trips. The shift from elections, full-year terms, and hierarchy to lotteries, rotation, and horizontal teamwork has made these student governments more inclusive, participative, and representative. It has also made participating in student government a richer and more equitable civic educational experience. Perhaps most importantly, these changes have started to reverse years of disengagement and apathy toward student government in these schools, and have challenged students to think more critically and creatively about what democracy means to them. Outgoing member of the student government explaining to new members their rotating weekly responsibilities. More information about Democracy In Practice and this initiative can be found on their website: www.democracyinpractice.org.